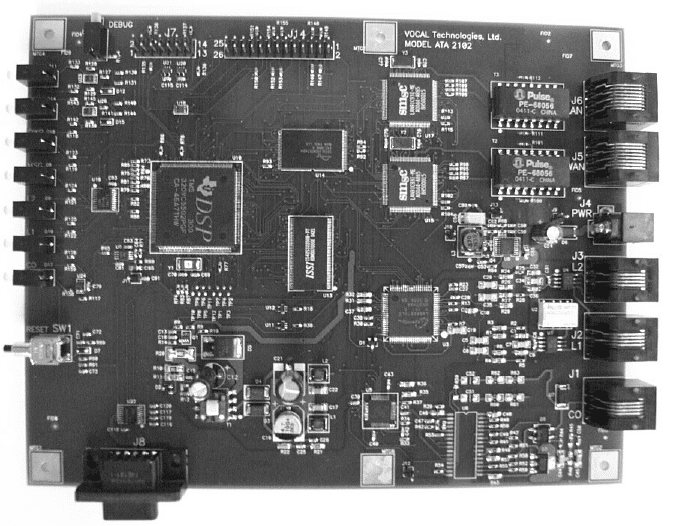 VOCAL’s ATA 2×2+1 development board supports up to two telephone lines, two Ethernet ports and a PSTN life-line port for automated voice service switching in case of a power outage or network disconnection and is stackable to support larger port configurations. End users can connect their homes and businesses to VoIP services using conventional wired and cordless phones without incurring additional monthly service fees or adding extra hardware. For VoIP service providers looking for a design that is easily configurable with their networks, VOCAL’s ATA solution provides secure and sophisticated Web-based provisioning and firmware update technology. The 2×2+1 ATA solution initiates calls using the rapidly emerging IP telephony standard Session Initiation Protocol (SIPv2) and supports multiple advanced codecs to optimize performance. The 2×2+1 ATA platform is reconfigurable in the field and designed to give OEMs and service providers the ability to bring their products to market quickly and deploy them with immediate interoperability in most broadband VoIP service provider networks. OEM customers can also take advantage of VOCAL’s high-end customization capabilities, including reference design assistance and integration of value-added features. Unlike traditional architectures, the 2×2+1 ATA hardware and software designs fully utilize leading DSP resources and advanced patent-pending algorithms to eliminate the need for an additional RISC processor, significantly reducing the typical bill of material cost per unit. The solution is ideal for VoIP equipment suppliers desiring to add a low-cost, compact ATA solution to their portfolios.